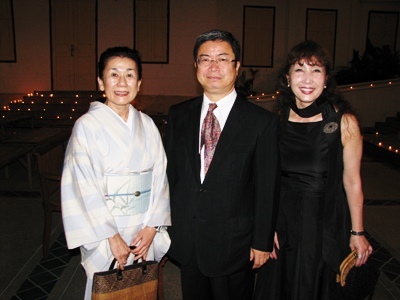 Artists Shigeno Suwada and Junko Masumoto are joined by the new Japanese Consul General Kazuo Shibata at the opening of the exhibition. The Lanna Japan Festival takes place in Chiang Mai every year and features unique and contemporary Japanese art and pop culture. This year, cosplayers even took part in the Japanese float during the Grand Parade for Loy Krathong. Additionally, unique attractions can be found around the city, from the calligraphy on display at CMU to the contemporary Japanese handicrafts exhibition at CMU Art Centre. The Art and Culture Museum behind the Three Kings Monument was also host to such an event, featuring modern dance performances by a Thai-Japanese duo and the artworks of Shigeno Sawada and Junko Masumoto entitled “A message from Paper & Iron” that runs until December 5. Featuring enormous paper fish swimming through waves made from saa like paper, and plume like paper on stalks of iron this modern display takes up a very large space on the second floor of the building. Be sure to check out all the exhibits on display. 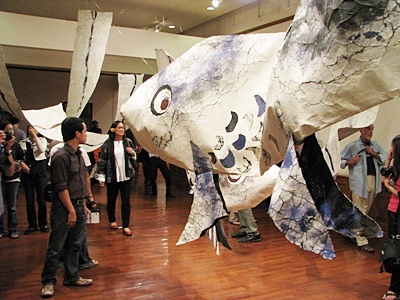 Some of the giant paper fish on display. 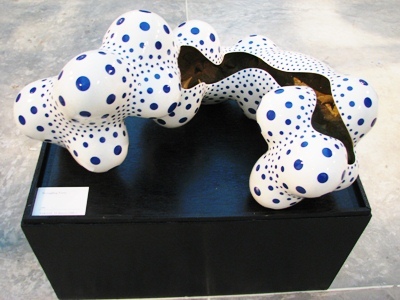 One of the unique ceramic works of art on display at Chiang Mai University’s Art Center as part of the Lanna Japan Festival, the show on Japanese contemporary handicrafts runs through December. 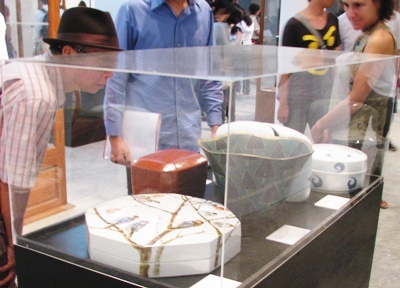 Visitors to the upstairs gallery at CMU’s Art Center were intrigued by the unique and beautiful ceramic and wood handicrafts on display, noting that Japanese culture has managed to meld the ancient and the modern and yet still remain uniquely Japanese. Gallery 116 has yet another interesting and attractive exhibition open to the public, this time devoted to portraits including many of members of the Royal Family, self-portraits and of other people. The Gallery, situated at 116 Charoen Muang Road just a short meander from the Nawarat Bridge, will be keeping this exhibition open until February 15th – and it is the third exhibition this year in this innovative gallery, founded and run by local entrepreneur Mrs Wanthip Nimmanhaeminda. Most of the portraits – there are about 40 of them – are traditional in conception with one notable rather abstract exception, and painted mainly with oil or acrylic. They form a great contrast to the last but one exhibition here – this time we have largely somber colours (there are a three stunning exceptions!) which contrast sharply to the exhibition of May this year where we were greeted by a blaze of radiant colours. The first notable exception is an attention-grabbing portrait of His Majesty the King, done in a blue wash and measuring a huge 150cms by 130cms. Artist Rungsak explained that the blue is taken from the centre of the Thai flag – the blue stripe in the flag representing the King. It is a great tribute to His Majesty entitled Love the King 2. A further portrait shows the Royal Princess MahaChakri Sirindhorn outlined against a white background. The artist has captured so eloquently the beloved Princess’s warm and attractive smile and it beams radiantly down at visitors as they enter the gallery. One other wonderful exhibit is a large-scale and reverential painting of the well-known monk Luang Tabua, painted by local artist Vichit Chaiwong, whose former Gongdee Studio was a great local attraction before moving to San Kampaeng. This large painting and many others are for sale, the proceeds going to local or Royal charities. Fourteen artists, some local, others from further afield including Bangkok, have contributed to this delightful display of talent and enterprise. Most of the portraits are of a reasonable size for living-room walls, measuring in the region of 50cms by 40cms. Interested visitors, having seen the style of the many artists whose work is on display, may commission a portrait of themselves or of their family and friends. It is well worth a visit to enjoy a browse in this interesting and eye-catching exhibition or you may wish to visit the website at: www. 116artgallery.com .What a great way to celebrate the New Year - commission a portrait to enhance your home! Despite all the warnings out there, one of the biggest mistakes I see from PC owners is the unpatched computer. So this week, why you need to apply patches and how you do it. Security patches are not unique to Microsoft. Although the software giant gets the most press, virtually every other piece of software may contain security holes that need to be “patched”. A quick glance at current vulnerabilities contains most of the heavyweights: IBM, HP, Symantec, Linux, Trend Micro, Google, Mozilla, Adobe; the list is endless. So what is a patch? Since most software is written by humans, it is inevitable that it will contain errors. These errors vary from code that can be exploited to crash a system to ones that allow an attacker to take over complete control of a computer. There are two sets of people looking for these errors, or security holes: Those with white hats, who want to help secure software, and will generally advise the software’s authors of the problem in secret, to allow them to fix it; and those with black hats, who want to exploit the hole for nefarious purposes. Keeping Antivirus software up to date is not a completely effective solution. Not only does it often take days for a virus to be identified and blocked, but in some cases it doesn’t even require a virus to attack your computer. Code Red, a fairly destructive worm from 2001, was able to spread from computer to computer by sending a simple web request to servers with a security flaw in Microsoft’s Internet Information Server. And, as I mentioned last time, other infection vectors are used such as USB drives. So if you want your computer properly patched, here’s how you do it. I’ll focus here on Microsoft Windows, but at the end I’ll give you a couple of links where you can go and check what’s going on in the Mac, Linux and application worlds. In your start menu is a “Windows Update” option. Just run it, and it will load Microsoft’s Update web site. You’ll see two options, Express and Custom. If you want to do this in two parts, go to Express. This will focus on what Microsoft call Critical Updates. However, I’d recommend you do the “Custom” update, because this will install all patches, including certain hardware drivers if they are there. Windows will now check its update catalogue to see what you have installed, and after a while, , it will list all of the updates outstanding. It will classify them as “Critical” and “Important”. You select “Review and Install Updates”, and then press the button to download and install everything outstanding. You’ll see how many updates there are, and the amount to be downloaded, before you do this, so you’ll have an idea of how long it may take. A word of warning here: If you start this, don’t necessarily expect it to run to completion without you doing anything else; certain updates may ask you to confirm a license agreement before it starts, so chug down that coldie while you watch for a while. Once all of the updates are downloaded, they will then start installing. There may be other “OK”’s to hit, so be prepared. But it’s a straightforward process. In my experience, most updates require a reboot on completion, which is where the next part comes in. Windows has looked at your current setup and updated the holes it sees, but this is an iterative process. If you are far behind on updates, you need to run the process again, and it will probably find more updates. You may have to do this two or more times if you haven’t applied updates for a long time. Finally, you can automate this procedure. Depending on your version of Windows, search the help for “Automatic Updates” and it will tell you where you can configure this behaviour. You can select the updates to be downloaded and installed when available, or just to download and wait for you to install them. Once you’ve got your PC up to date, updates normally come once a month from Microsoft, on what is called “Patch Tuesday”. On an average month there are around 10-15 of them. If you see a recommendation to upgrade to “Microsoft Update” by the way, take it. This will also download updates for your other Microsoft products like Word, Excel and Powerpoint. If you’re interested, you can find out more about vulnerabilities from the HNS website at http://www.net-security.org/vulnerabilities.php?d=20 or http://www.us-cert.gov/cas/bulletins/. Feel free to email [email protected] with your computer related questions.